Steiner, Hugo. 2002. "BORNEO - It's Mountains and Lowlands With Their Pitcher Plants". Toihaan Publishing Company Sdn. Bhd., Kota Kinabalu, Malaysia. ISBN 983-40421-1-6, 136 p., approx. 190 (!) colour photographs, figures and maps. Hard cover, 19.5 x 26 cm, $US 43. Visiting Borneo in 1992, the meanwhile retired Swiss medical doctor (endocrinology) Hugo Steiner and his wife "became trapped" by the beauty and fascination of Borneo's famous Nepenthes. Thus, until 2002 they returned every year for a month to visit many of the habitats in Sabah and Sarawak, supported by local guides. They met experts like Charles Clarke and Ch'ien C. Lee (who provided a nice photo of his recently re-discovered Nepenthes campanulata), and they define the aim of the resulting book as "... to give an impression of their (rem. S.H: pitcher plants) natural habitats by detailed photographs... not as a serious scientific account, but instead to focus our presentation on the aesthetic aspect ...". Actually, turning over the pages, numerous colour photographs combining landscapes and plant details let the reader's imagination dive into the unique atmosphere of those tropical habitats. This is underlined by an entertaining text, maps and tables. Especially people looking for an interesting but not too technical or scientific work on Borneo and its pitcher plants are addressed. Writing about the historical aspects, the author refers to the work of Martin Cheek & Matthew Jebb, unfortunately their important contribution "Flora Malesiana (Series I - Seed Plants)- Nepenthaceae" (ISBN 90-71236-49-8), is not listed in the references. Conservation, biology and ecology are discussed in separate chapters. Pictures and descriptions of the Sabah and Sarawak species are provided, and the Kalimantan (Indonesian Borneo) species are mentioned. However, on this listing Nepenthes boschiana is missing. The aesthetic aspect remains very good despite 2 or 3 low quality photos, and a printing mistake at the photo text "Male inflorescence of an upper pitcher" (pitchers do not bear inflorescences), here "Upper pitcher and male inflorescence" was meant correctly. However, I oppose one statement concerning the survival of endangered species. The author mentions "A marginal, and rather theoretical method to save Nepenthes ... by hybridisation. ", (if the habitats are destroyed), and "... to reduce to the parent state again later" (if new habitats are available). The idea: hybrids are surviving more easily in cultivation. Even though the author mentions this method only very carefully, I would like to declare it as a deadly threat to any natural species because the idea to reconstruct the original species genome from a hybrid is only fiction. Further, I do not know any source reporting on the production of alcohol to support digestion inside the pitchers, as mentioned two times in the book. 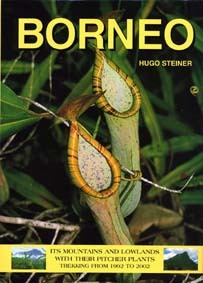 But even in spite of these critical remarks I would like to underline that Hugo Steiner has achieved his above mentioned goal: to publish an aesthetic book on the pitcher plants of Borneo. For CP enthusiasts this work should not be considered a competitor but a richly illustrated supplement to Charles Clarke's famous book "Nepenthes of Borneo" (ISBN 983-812-015-4), and for laymen it is a recommendable easy to read entrance into the fascinating world of tropical pitcher plants in the midst of their natural habitats. I like it.